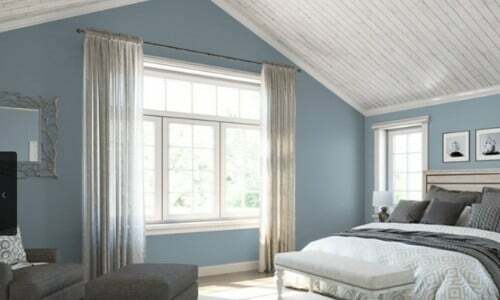 Blue gray paint colors are very popular, and they are the rise. Blues are calm and relaxing and when you combine them with gray undertones, you have a super stylish mix. Blue grays look more sophisticated and upscale than a typical blue, and since gray is so stylish, it’s the perfect recipe. Blue grays are especially popular for bedrooms, since blues help you get the best night’s sleep, followed very closely by gray. And, they work for most rooms of the home, especially living rooms, dining rooms, bathrooms and even kitchens (if you have white cabinets). What is blue gray paint color? What does that really mean? 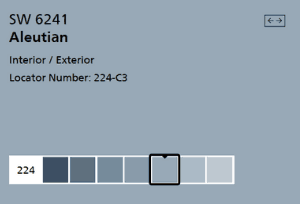 I considerblue gray to be primarily a blue color with gray undertones (or gray mixed in). So they are more like dusty blues. But, there are some others that believe it’s more of a gray color with cool blue undertones. The truth is there is a range of color expectations when someone say blue gray or bluish gray or grayish blue. So, I always need to double check with customers to probe what they really mean. The best way to do this is show them color swatches and have them react. Did they mean something like this, or did they want something more blue or more gray (or lighter or darker). For that reason, I’m going to share a wide range of blue grays – ones that are more gray, ones that are more blue, lighter ones and darker ones. i want to stress that there is no wrong answer here…it’s more a matter of what you prefer. All of these colors can work pending on your style and purpose. And, don’t forget that some of these colors can be used as accent walls (rather than all four walls. The world is your oyster. 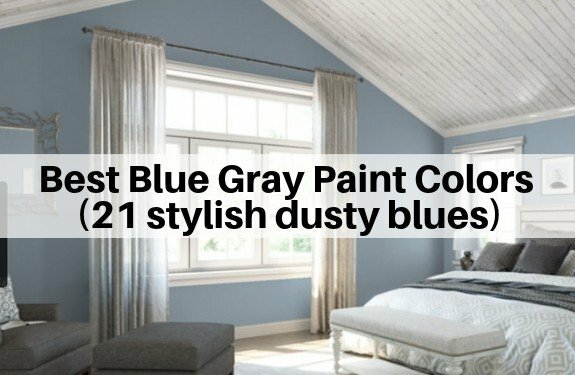 What are the most popular blue gray paints colors? 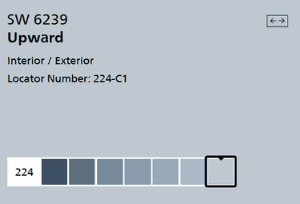 Icy (SW6534) is one of my favorites because it’s a light blue gray. 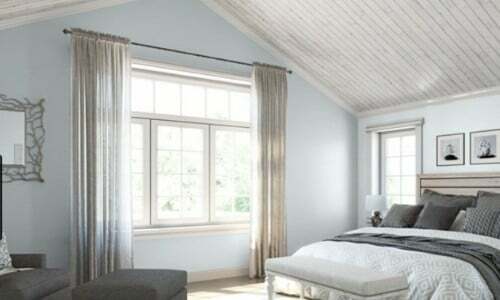 It’s perfect for bedrooms if you want a light neutral blue. 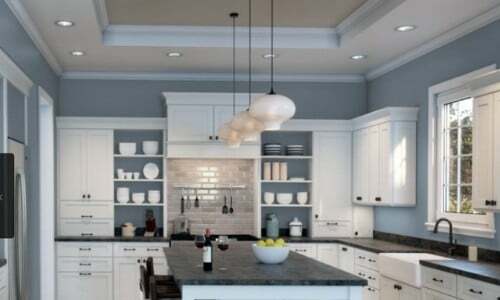 The gray undertones give it more sophisticated look (so you avoid the baby blue look). And, it works for areas that even in rooms that don’t have a ton of light. 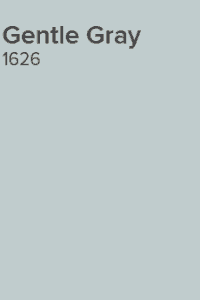 I think this is my favorite Benjamin Moore blue gray. It’s the perfect balance of the two for a true upscale look. 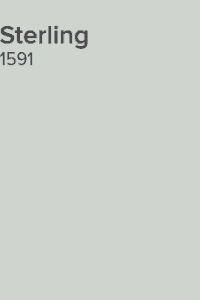 The one downside of this paint shade is that it’s only available in their Aura line. Aura is absolutely awesome – the best of the best – but it is a bit pricey, so it doesn’t work for everyone’s budget. 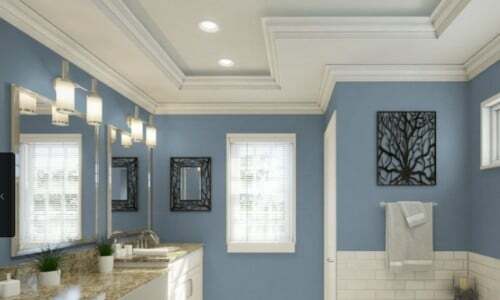 While Behr is not my favorite paint brand, I absolutely adore some of their blues, and Thundercloud (S520-5) has got to be my favorite. Every time I come across it on Pinterest I stop to take a look. It is so exquisite and soothing. It’s another example of a perfect blend of blue and gray. When you compare it to Flower box, it has super subtle green undertones and a bit less purple. I love them both. 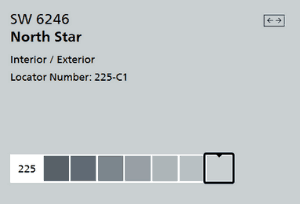 North Star (SW 6246) is more of a cool gray with pale blue undertones. It’s a very neutral color, so it works well for more masculine decor. I love it with dark hardwoo floors and a light/white area rug. 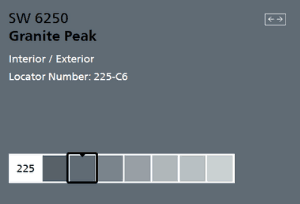 Granite Peak (SW 6250) is a dark gray with blue mixed in and some super subtle green undertones. 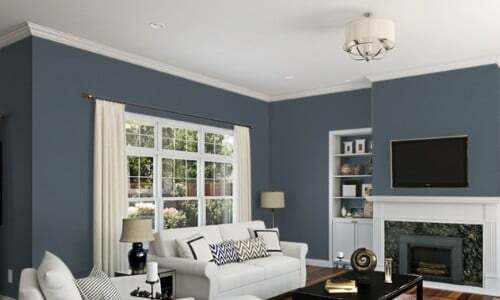 It’s a deep grayish blue that is perfect for accent walls, powder or media rooms. It really adds drama to your space. Comet (1628) is a light dusty blue. If you look closely, you’ll see pale purple and navy undertones infused with a strong gray. Bachelor blue (1629) is a deeper version of Comet so it almost reads as a light dusty navy. Both Comet and Bachelor Blue coordinate well together so you can use Comet as your base color and Bachelor Blue as an accent wall. 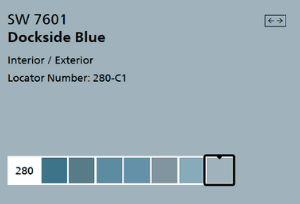 Dockside Blue (SW 7601) is dusty blue gray. If you look closely, you’ll notice some subtle green and aqua tones. The grays smooth out color and more sophisticated look than your typical blue. 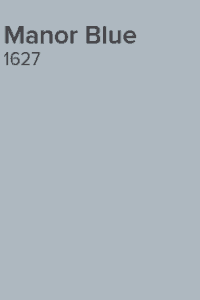 Sterling (1591) is a cool gray that’s super neutral. This color is a bit tricky as it reads gray on the paint chip, but in real like it looks a bit more blue than gray once it’s on the walls. it’s just the way the light reflects on it. This is why it always make sense to get testers and put them on your walls so you can see the color with your lighting. These next 5 blue grays all work together. You’ll find them all on the same Sherwin Williams Color strrip in their color fan deck. They all use the same tone, so you can coordinate these colors together – either in different rooms of the home, or use as accent walls. 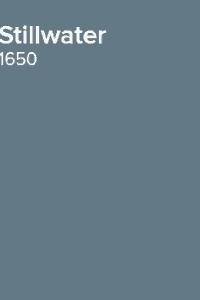 Upward (SW6239) is a very subtle gray blue. In fact, you barely notice the blue. You’ll see that as you move down the color strip, the blue becomes more saturated and noticeable..In the below picture, this color looks bluer than it usually does. 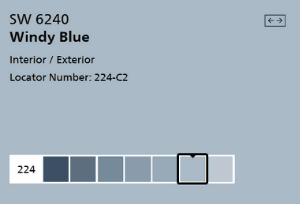 Windy Blue ((SW6240) is one of my favorite blue grays. The blue comes through much stronger than it does in upward and since I love blues, it perfect for my tastes. The subtle grays round out the color and give it staying power. Pair it with dark hardwood floors and black furniture and you’re all set. 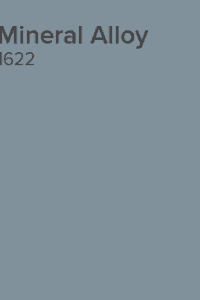 Aleutian (SW 6241) is a deeper blue gray and it just works. It works equally well with dark and light hardwood floors (or even an off white carpet). Add navy and white accents and you’re in great shape. Daphne (SW 9151) is a slightly darker version of Aleutian. It pairs well with Windy Blue as well as Distance or Indigo Batik. 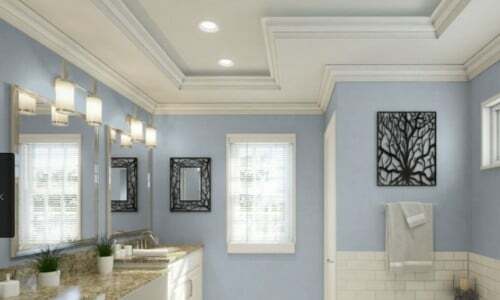 It contrasts really well with white base molding and trim, so if you have a room with wainscoting or bead board. Bracing Blue (SW 6242) is an even deeper version of Daphne. It’s a deep darkish color and often works well with a lot of white (e.g. white cabinets, wainscoting etc.) or as an accent wall. It’s a deep dusty blue. Before I cover the final 7 bluish gray paint colors, I wanted to share a VERY helpful video from Sherwin Williams, with some quick and super useful DIY painting tips. It’s just 2 minutes and covers types of brushes and painting techniques. Also, at the end of this article, I share the painting tools and accessories that we use (with links to buy them on Amazon). 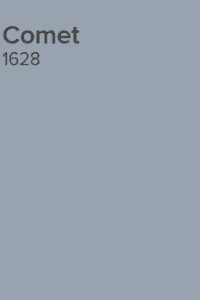 Stillwater (1650) is a darker blue gray. In fact, I might call it a dusty navy. Due to the gray undertones, it makes this navy look a bit lighter than your typical navy, so it doesn’t swallow up a room. There are also some super subtle green undertones, so it gives it a soothing feel. Morning Fog (SW 6255) is really a gray. It’s a cool gray due to the subtle blue undertones. It’s a really steely gray with depth and stamina. It pairs with with Granite Peak. 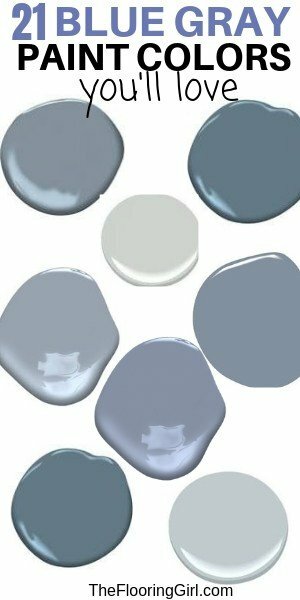 Manor Blue (1627) is pale blue gray that gives it a muted tone and upscale look. It also has a smidge of violet undertones for a more soothing effect. It’s a great choice for modern farmhouse decor. Krypton (SW 6247) is a light cool gray. It also has subtle blue undertones. It’s a deeper version of North Star, but the blues permeate through a bit more. 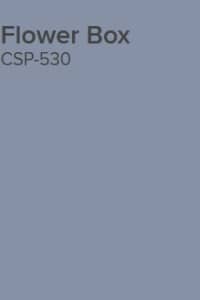 Mineral Alloy (622) is a darker gray blue. As the name implies, it looks like a metal color. 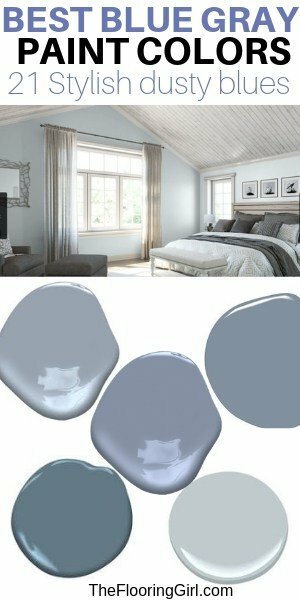 It’s part of their classics line and I see it most often bedrooms as it’s on the darker gray/blue side…so it’s one of those colors that relaxes you and helps you fall asleep faster. Tranquil Pond (PPU15-07) is another favorite. It looks super similar to Benjamin Moore’s Flower pot, as well as similar to Thundercloud, but it’s a bit more purple. So, it’s kind of like a dusty blue purple. 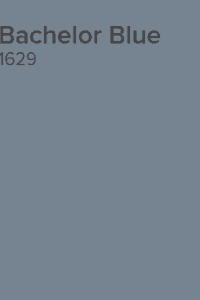 Gentle Gray (1626) is a light gray blue with an aqua undertone. This color tends to shift based on lighting and the other elements in the room. Sometimes it looks more gray, other times more blue and other times it looks like a dusty aqua. The grays make it look more upscale and sophisticated than a typical aqua. 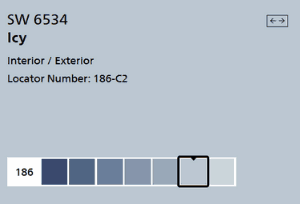 As you can see, there’s a wide range of paint shades when it comes to blue grays. 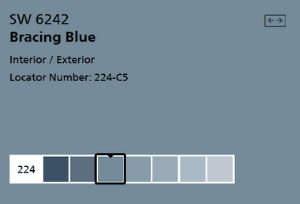 I love this color combo because it combines two of my favorite colors – blues and grays. Different people have different expectations when they say blue gray…or gray blue. Hopefully, you can find at least 1 bluish gray that love…because that’s all you’ll ever need. 21 Soothing blue gray paint colors for walls for a stylish and calming room. Love the selection and range here. 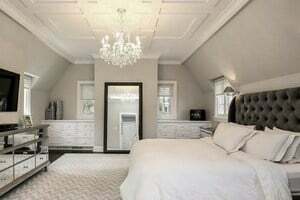 Do darker accent walls work in small spaces to help define areas? Or is it better to go for a light shade throughout in a studio or small 1 BR? Antonia – yes, I love some of the mid to darker blues, too. But, if you have a small apartment, I’d gravitate towards 1 color and slightly lighter. If you go too dark, it will make your space look too small. Would you keep the trim and doors a simple white color for most of these paints or would you try for a very, very light blue tint? 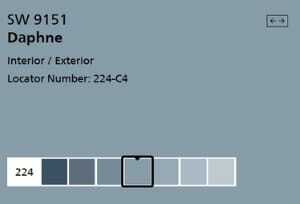 Ruthmarie – I would definitely do white trim with these paint colors. It looks much cleaner and more upscale vs. tinting it blue. (And, yes, I’ve seen them done both ways). And, a white white is best for blue shades (rather than an off white). Thank you for the response. I like the idea of white trim as well. I have something of a followup question regarding white paint. When you say white, do you mean a hard bright white, or something a bit softer? There are so many variations on white. I really love the look of these paint colors from Sherwin Williams and Benjamin Moore. I know that they are good quality paints, but was wondering if there are some basic differences between the brands. Grace – So glad you love them, too. Both Benjamin Moore and Sherwin Williams have great paints, so you can’t go wrong with either. They each have different grades, too. The good news is that you can get these colors at either store and they have the formula cards for each others’ paints (as well as most for Behr). 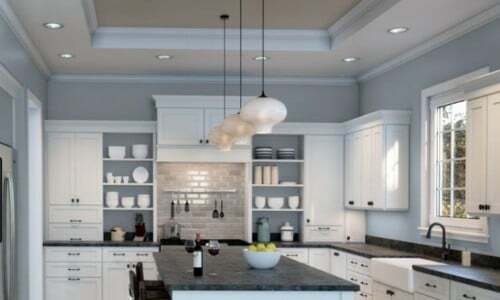 When you paint the kitchen, what type of paint do you suggest. I really like that flat matte look, but I would think it would make the walls harder to keep clean. Is it better to settle for a low gloss/eggshell for areas like kitchens? Ruth – I think eggshell or shinier looks tacky and dated. Instead, you should upgrade the paint. If you’re using Benjamin Moore, use their kitchen and bath paint. If you’re using Sherwin Williams, then use Duration. Both are wipeable. I would probably do a matte finish in there, and by upgrading you won’t have a trade-off on cleaning vs looks. Donna – Let me know if you want to set up a design consultation and you can send me some pictures. Please use the contact form. It’s impossible for me to help you without seeing this. We’ve gone for a lovely shade of grey on the feature wall in our living room. The other walls are white and they are a huge hit with any visitors we have in our home. Thanks for highlighting all the latest ideas and tips here. Question: Would you make the floor a shade of gray too? Or should we stay with the light brown wooden floors that we now have? Wish I could add a photo here. Joleisa – So glad you’re happy with you paint colors. No, I would not do gray floors with gray wall…that would be too much gray and take away from the walls that are working for you. I would either do a form of brown or else natural with Bona Traffic so you don’t have yellow on the floors.